Jimmie Johnson ended a career-longest 24-race winless streak on Sunday when he won the hurricane-delayed Sprint Cup Series race at Charlotte Motor Speedway. The victory give him automatic entry into the upcoming Round of Eight in the Chase playoffs, thus keeping hopes alive for Johnson to win a record-tying seventh Cup championship. 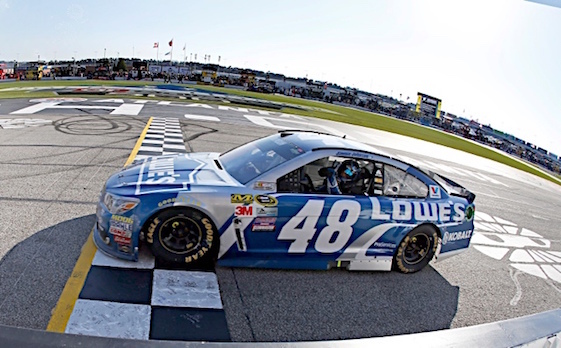 Johnson led 155 laps at the 1.5-CMS mile Sunday in his Hendrick Motorsports Chevrolet. Chase driver Matt Kenseth of Joe Gibbs Racing finished second. A large number of Chasers, however, had rough days as mechanical problems and wrecks sent top contender after top contender to the Charlotte garages. Non-Chasers Kasey Kahne, Ryan Newman and Kyle Larson finished third and fifth respectively. Kevin Harvick started from the pole and led the first 12 laps. The Stewart-Haas Racing driver was passed for the lead by rookie Chase Elliott, who led the next 101 laps. On Lap 114, Joey Logano took the lead when Elliott pitted. The Team Penske’s lead didn’t last long, however, as he blew a tire and hit the wall on Lap 116. Taking over was Johnson. Johnson fell to second place when he was passed by Denny Hamlin on a Lap 124 restart. On Lap 154, two Chasers ran into trouble: Harvick had an electrical problem and had to pit while Logano blew another tire found the wall again. Both were forced to the garages. After the ensuing restart, Hamlin, Johnson, Keselowski and Elliott broke free of the pack and ran nose to tail and, often, door to door. On Lap 177, Johnson moved past Hamlin and into the lead. Once out front, Johnson moved out to a big lead. Disaster struck a couple more Chase drivers on a restart on Lap 258. Austin Dillon was on the front row for the restart having only taken two tires during the preceding caution. When leader Johnson took the green, Dillon was rear-ended by Truex. Dillon’s Richard Childress Racing spun and slammed the inside pit-out wall. Also caught up was Elliott as he was spun from behind by Kyle Busch. Elliott’s car hit the outside wall hard. Both Elliott and Dillon were knocked out of the race. Truex suffered minimal damage while Busch sustained damage that needed attention in the pits. Also suffering minor damage were Chasers Carl Edwards and Kurt Busch. The field, meanwhile was red flagged to a halt. The next Chaser to be sent to the garages was Hamlin. With 27 laps remaining and while running second to Johnson, the engine in Hamlin’s Joe Gibbs Racing Toyota let go in a cloud of blue oil smoke. During the ensuing yellow flag pit stops, Kenseth got great work from his crew and came out in front of Johnson. Not having a great stop was Truex, who blew a clutch and dropped from third to 16th. On the restart, which came with 16 laps to go, Kenseth wiggled and Johnson quickly surged ahed to take the lead. Once out front, Johnson pulled away and with 10 laps to go, was over a second ahead of Kenseth. His margin of victory was 1.4 seconds. Alex Bowman, who opened eyes by qualifying the No. 88 Hendrick car in place injured Dale Earnhardt Jr. second fastest, saw his big weekend come to and end when he blew a tire and wrecked on Lap 62. Bowman’s wreck ruined the day of Casey Mears. (11) Jimmie Johnson, Chevrolet, 334. (17) Matt Kenseth, Toyota, 334. (12) Kasey Kahne, Chevrolet, 334. (21) Ryan Newman, Chevrolet, 334. (25) Kyle Larson, Chevrolet, 334. (4) Kyle Busch, Toyota, 334. (20) Brad Keselowski, Ford, 334. (23) Kurt Busch, Chevrolet, 334. (5) Tony Stewart, Chevrolet, 334. (16) Jamie McMurray, Chevrolet, 334. (13) Danica Patrick, Chevrolet, 334. (8) Carl Edwards, Toyota, 334. (7) Martin Truex Jr, Toyota, 334. (22) Michael McDowell, Chevrolet, 334. (33) Aric Almirola, Ford, 334. (26) Chris Buescher #, Ford, 334. (31) Clint Bowyer, Chevrolet, 334. (27) Trevor Bayne, Ford, 334. (32) Landon Cassill, Ford, 334. (15) Ricky Stenhouse Jr, Ford, 333. (35) Regan Smith, Chevrolet, 333. (30) Brian Scott #, Ford, 333. (34) David Ragan, Toyota, 331. (37) Michael Annett, Chevrolet, 330. (24) Matt DiBenedetto, Toyota, 329. (38) Jeffrey Earnhardt #, Ford, 328. (36) * Cole Whitt, Chevrolet, 327. (39) * Reed Sorenson, Chevrolet, 321. (40) * Josh Wise, Chevrolet, 320. (9) Denny Hamlin, Toyota, Engine, 308. (18) * Ryan Blaney #, Ford, 307. (19) Austin Dillon, Chevrolet, Accident, 258. (3) Chase Elliott #, Chevrolet, Accident, 258. (28) Paul Menard, Chevrolet, Accident, 258. (14) Greg Biffle, Ford, Accident, 257. (10) Joey Logano, Ford, 254. (6) AJ Allmendinger, Chevrolet, Accident, 252. (1) Kevin Harvick, Chevrolet, Engine, 155. (2) Alex Bowman(i), Chevrolet, Accident, 61. (29) Casey Mears, Chevrolet, Accident, 61. Average Speed of Race Winner: 134.929 mph. Time of Race: 03 Hrs, 42 Mins, 47 Secs. Margin of Victory: 1.474 Seconds. Caution Flags: 8 for 51 laps. Lap Leaders: K. Harvick 1-12; C. Elliott # 13-113; J. Logano 114-116; J. Johnson 117-118; D. Hamlin 119; J. Johnson 120-124; D. Hamlin 125-175; J. Johnson 176-213; R. Newman 214; Kyle Busch 215; C. Bowyer 216-217; J. Johnson 218-229; C. Elliott # 230; J. Johnson 231-253; C. Elliott # 254; J. Johnson 255-311; M. Kenseth 312-316; J. Johnson 317-334. Leaders Summary (Driver, Times Lead, Laps Led): J. Johnson 7 times for 155 laps; C. Elliott # 3 times for 103 laps; D. Hamlin 2 times for 52 laps; K. Harvick 1 time for 12 laps; M. Kenseth 1 time for 5 laps; J. Logano 1 time for 3 laps; C. Bowyer 1 time for 2 laps; Kyle Busch 1 time for 1 lap; R. Newman 1 time for 1 lap. Top 16 in Points: J. Johnson – 3,045; M. Kenseth – 3,040; Kyle Busch – 3,036; B. Keselowski – 3,034; Kurt Busch – 3,033; C. Edwards – 3,029; M. Truex Jr – 3,028; D. Hamlin – 3,012; A. Dillon – 3,009; C. Elliott # – 3,009; J. Logano – 3,006; K. Harvick – 3,004; K. Larson – 2,109; T. Stewart – 2,106; J. Mcmurray – 2,084; C. Buescher # – 2,070.